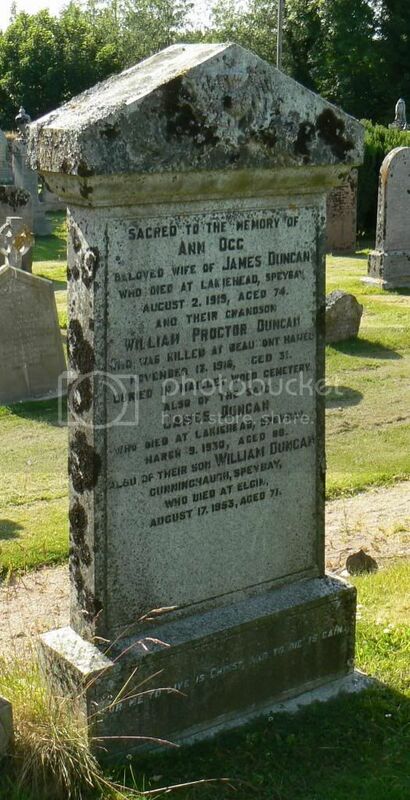 Son of William Adam Anderson and the late Diana Stronach Anderson, of Bellie, Fochabers; husband of Mary Anderson, of 27, South St., Elgin. 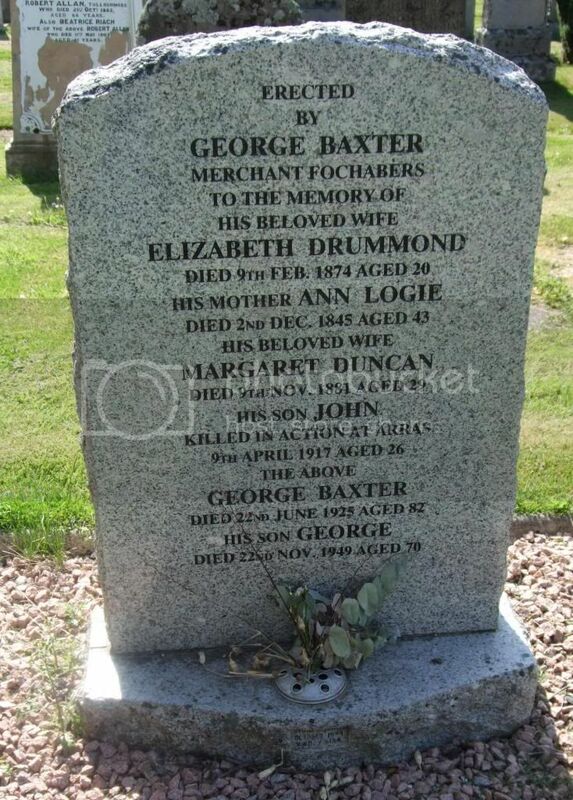 Son of George and Margaret Baxter, of Fochabers, Morayshire. 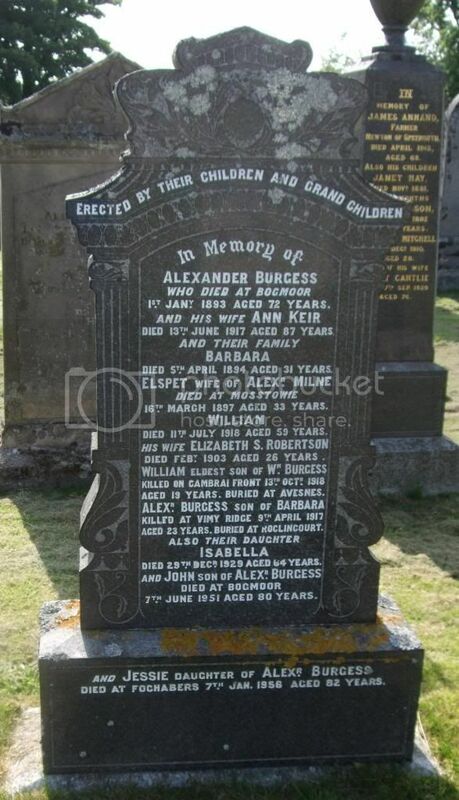 Brother of James Burgess, of Bogmoor, Spey Bay, Morayshire. Born at Bogmoor, Spey Bay, Morayshire. Regiment/Service:East Lancashire Regiment 1st Bn. Panel Reference Pier and Face 6 C.
Husband of Isabell Gilbert (formerly Chalmers), of Ardkeilling Cottage, Lhanbryde, Morayshire. 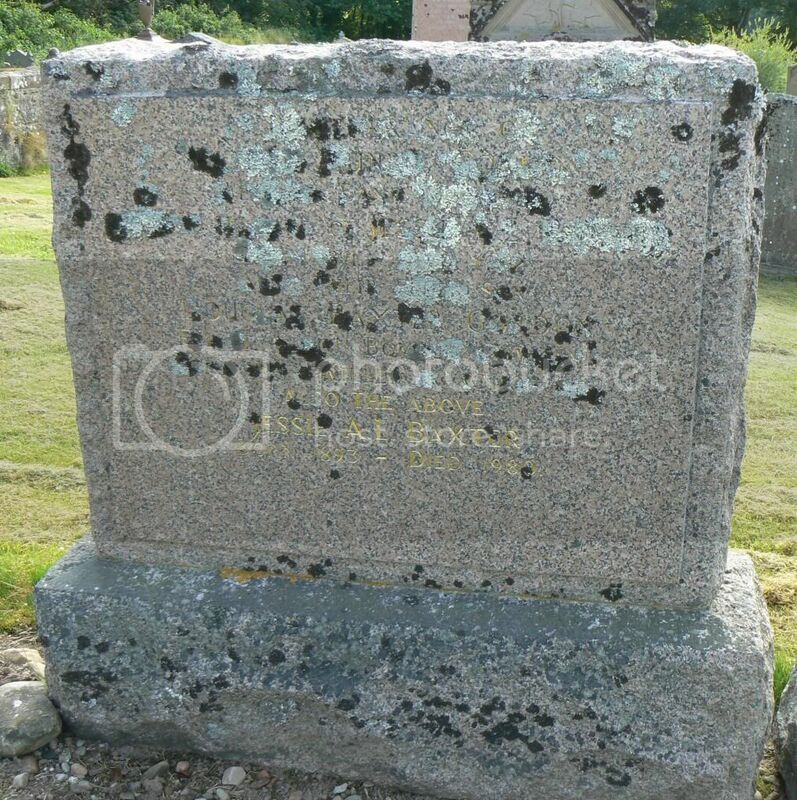 Son of George and Jessie Johnston Chalmers, of Richmond Cottage, Fochabers, Morayshire. 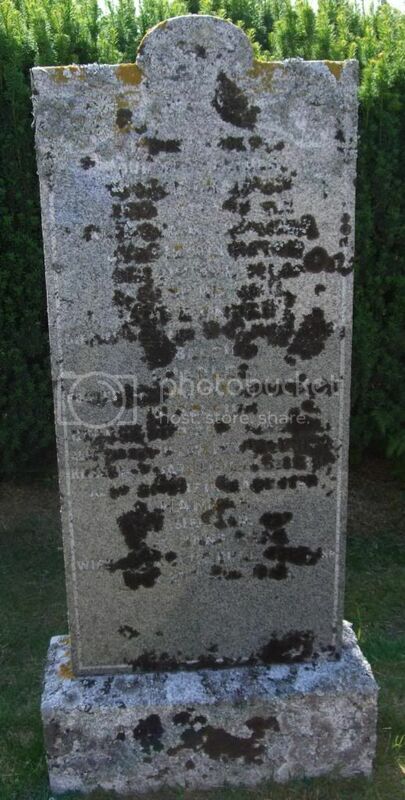 Son of Robert and Mary Geddes Knight, of Buckie; husband of Hannah Knight, of South Row, Fochabers, Morayshire. 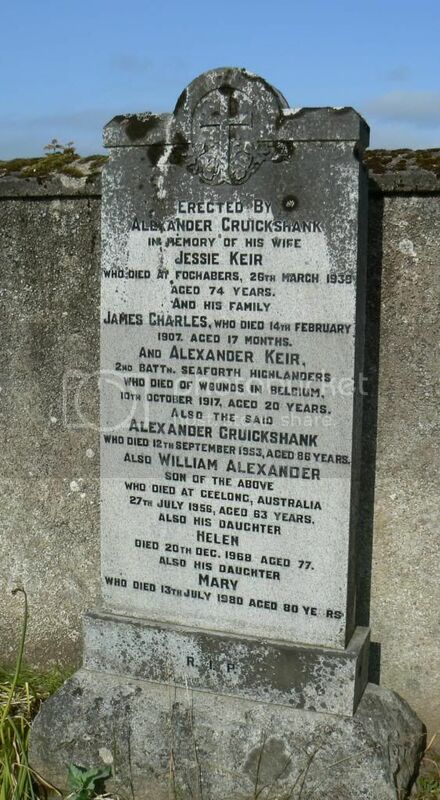 Son of Alexander Cruickshank, of High St., Fochabers, Morayshire. Grandson of James Duncan, of Lakiehead, Spey Bay, Morayshire. 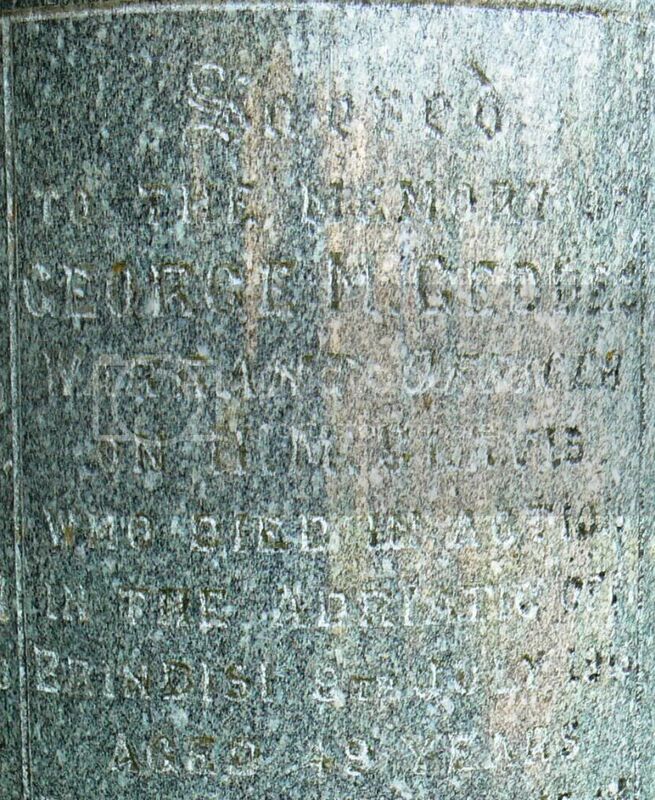 Panel ReferencePanel 17, Column 2. Son of Robert and Mary Finlayson, of Spey Bay, Morayshire. Regiment/Service:Black Watch (Royal Highlanders) 8th Bn. Son of Margaret M. Forbes, of Upper Mill, Kintore, Aberdeenshire, and the late George Forbes. Native of Enzie, Banffshire. Son of Alexander and Jane Fraser, of Fochabers, Morayshire. Regiment/Service:Royal Naval Reserve H.M. Drifter "Clavis." Gold Medal (Serbia). 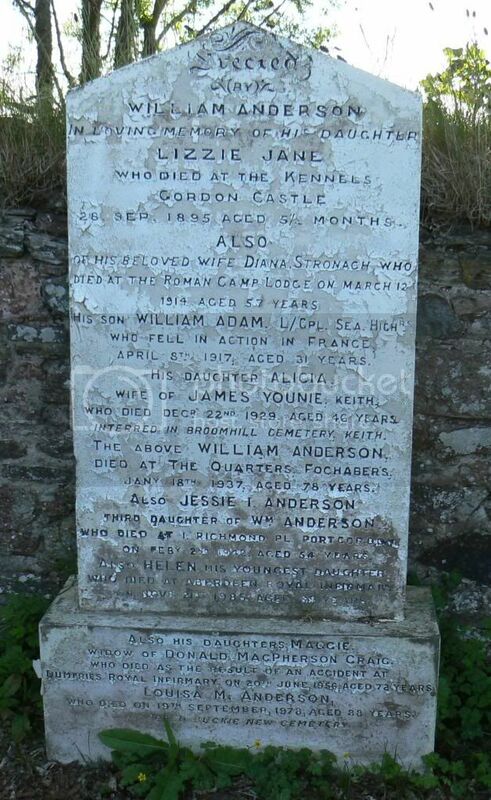 Husband of Isabella Geddes, of 19, Gordon St., Port Gordon, Banffshire. Regiment/Service:Royal Air Force Volunteer Reserve 460 (R.A.A.F.) 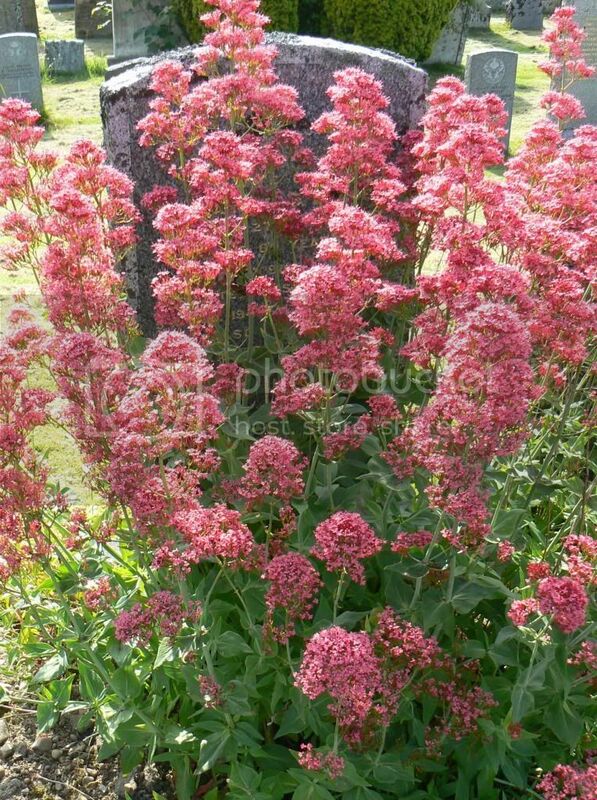 Sqdn Grave ReferenceColl. grave 9. C. 19-21. 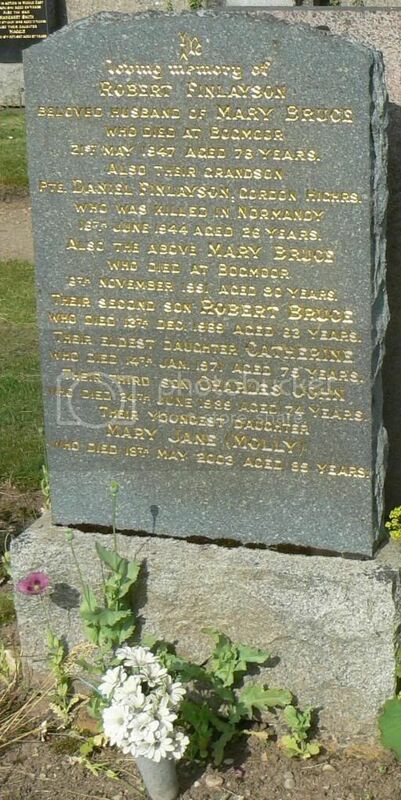 Son of Wilfrid Munro Gordon and Jessie Ann Logie Baxter Gordon, of Fochabers, Morayshire. Regiment/Service:Gordon Highlanders "B" Coy. 4th Bn. Son of William and Annie Gordon, of Ivy Cottage, Tugnet, Spey Bay, Morayshire. 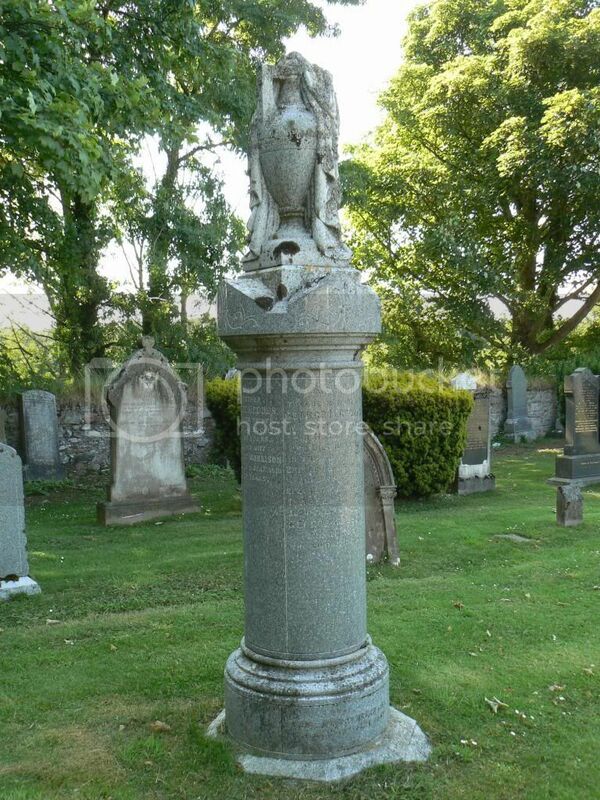 Son of John Grant, of Gordon Square, Fochabers, Morayshire. Grave ReferenceSp. Mem. A. 8. 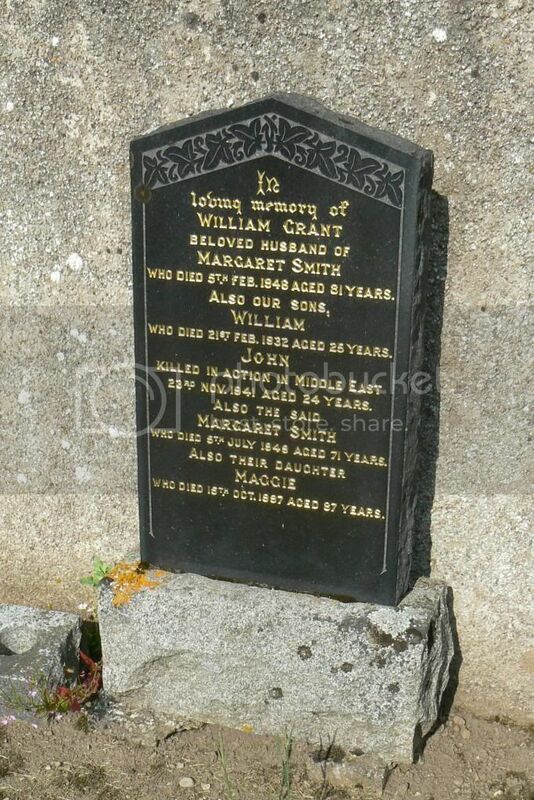 Son of William and Margaret Grant, of Fochabers, Morayshire. 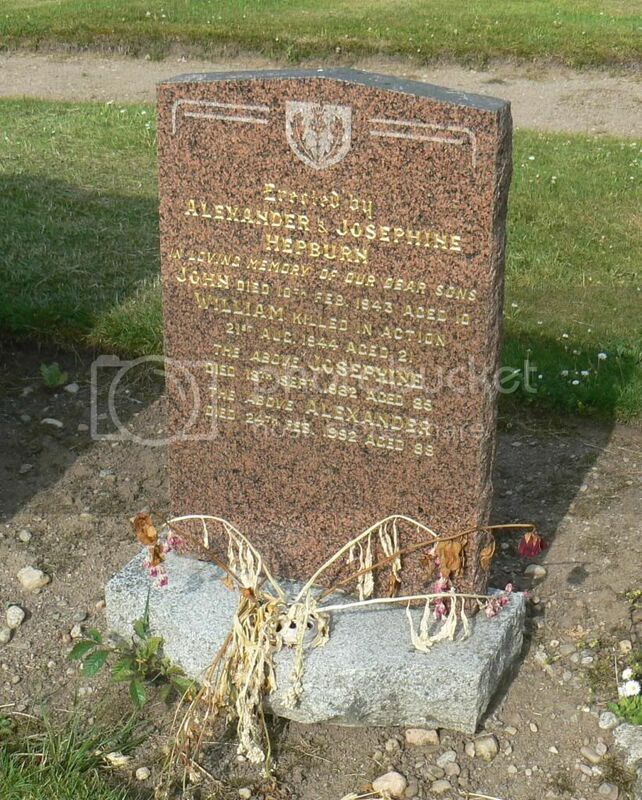 Son of Alexander and Josephine Hepburn, of Fochabers, Morayshire.